The ContiRoadAttack 2 EVO redefines the limits in Touring Sport. GT version with an additional ply in the carcass of the rear wheel, designed to meet the higher loads of heavy touring bikes. The Allround tire with the highest standards in the sport touring segment. 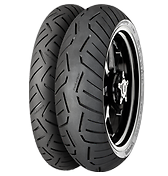 Sport touring radial tire for the price conscious rider.